Are you guys ready for Halloween yet? I’ve slowly been getting there and just this week was able to add a bunch more Halloween decor to the house. 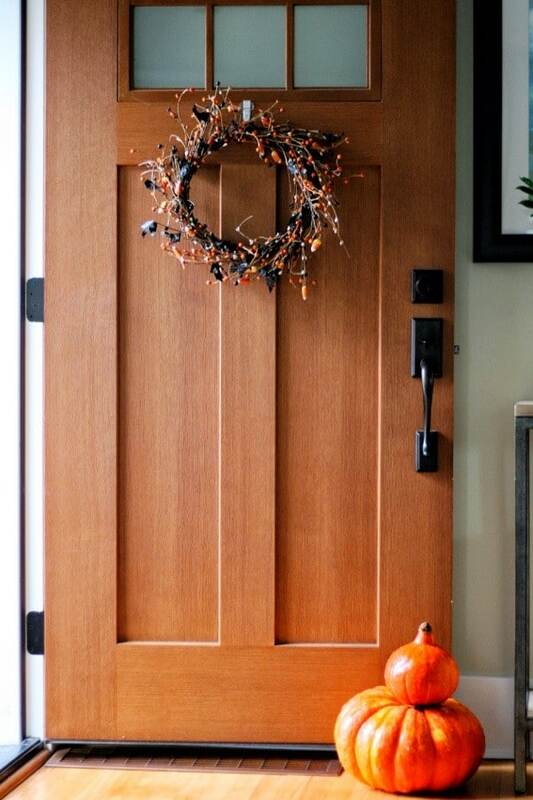 We still need to carve our pumpkins, add some halloween lights to our door and of course buy candy (which is best to buy the week of because it all goes on sale then). For the most part though – I think we are pretty much set for Halloween. I always feel a little bit like a kid again around this time of year. That’s ok, right? 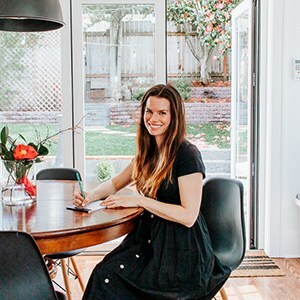 We put the kids to bed, grab a glass of wine and have a little date night with Hallmark. Too cheesy? So I wanted to show you guys our house right now all decked out for Halloween. 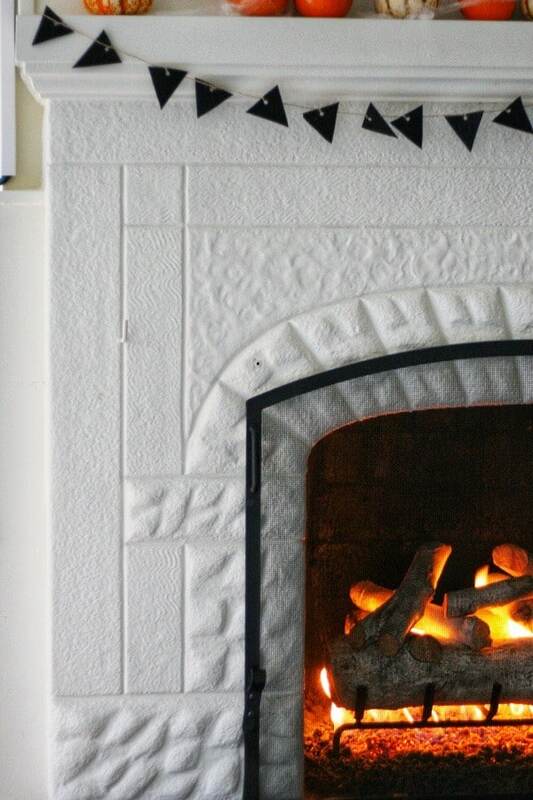 I hope this gives you some halloween decor ideas. You know me, I don’t like a lot of clutter and I don’t like to spend a lot for anything. I have nowhere to store a bunch of decorations. And to be honest, Christmas stuff really takes priority with the storage space we have. 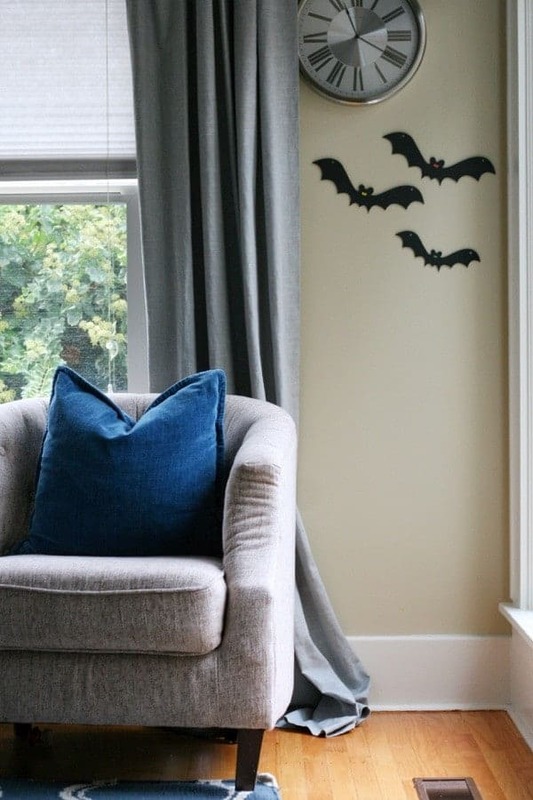 The following are really easy and inexpensive ways to decorate your home for Halloween. 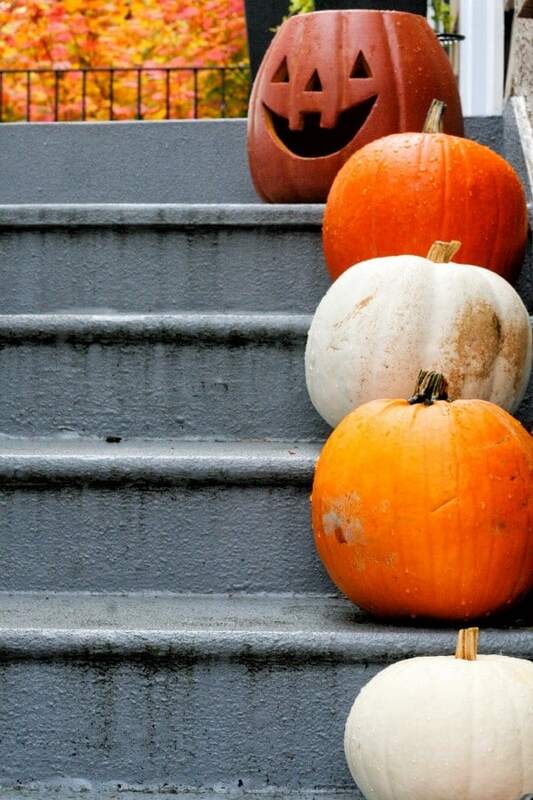 Pumpkins – Obviously. Preferably carved. 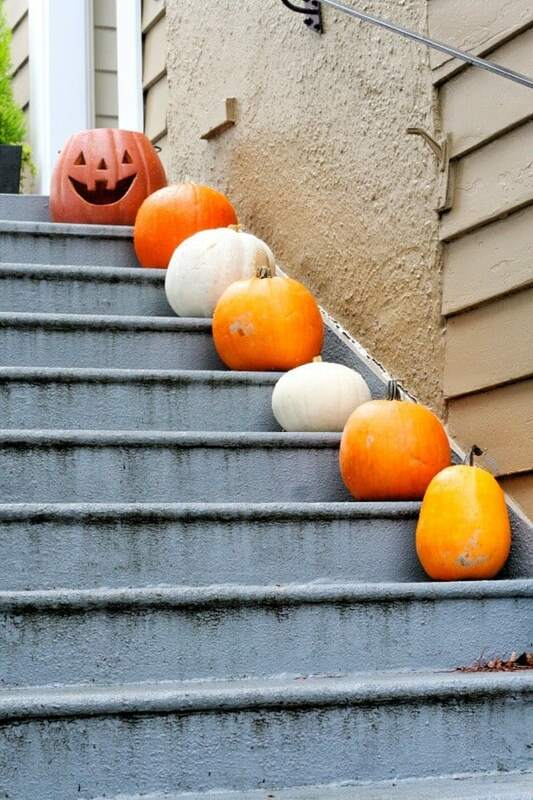 We still need to carve these bad boys but we lined some pumpkins all the way up the steps to our front door. 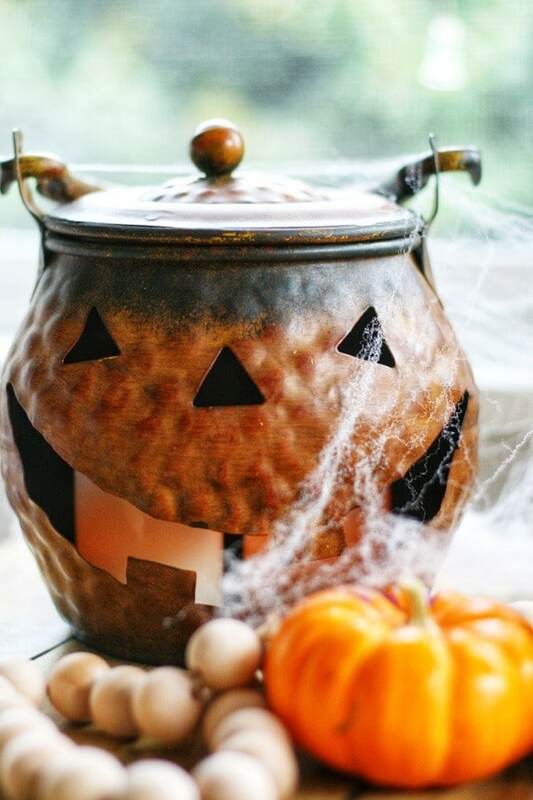 At night, I’ll put some flameless candles in them to illuminate the way to the candy. That pumpkin at the top is actually ceramic from Home Depot. It’s a great size, really heavy and weather proof. This next photo isn’t exactly spooky but I had to show you guys how pretty this little scene is on our front porch. 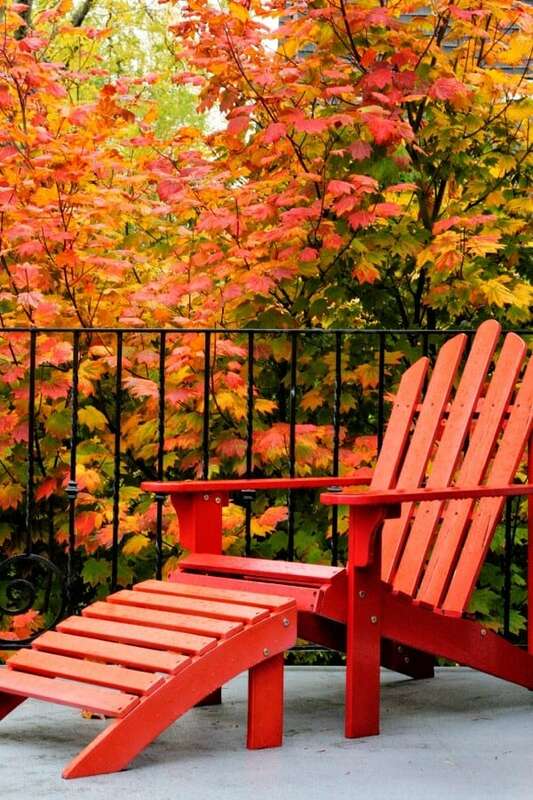 A gorgeous red tree backdrop for our red adirondack chair. I love fall! I love my little Halloween wreath. 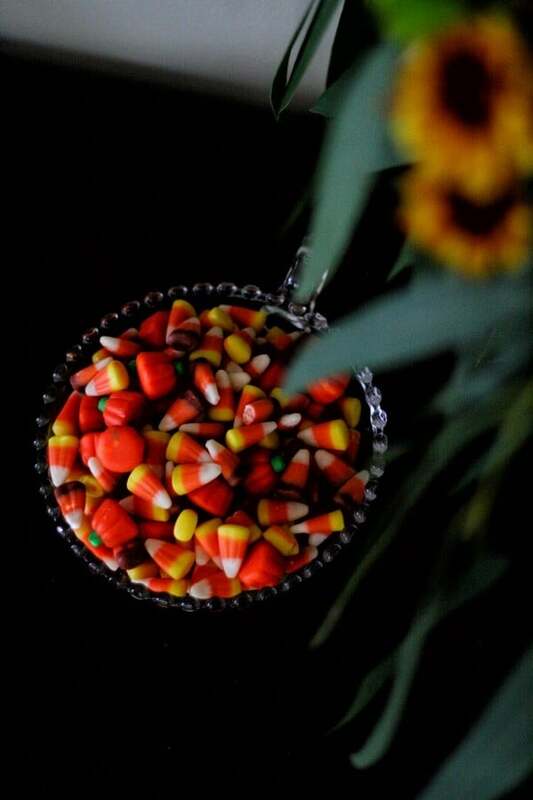 It’s made with faux candy corns and faux black leaves. Here’s another easy wreath idea. 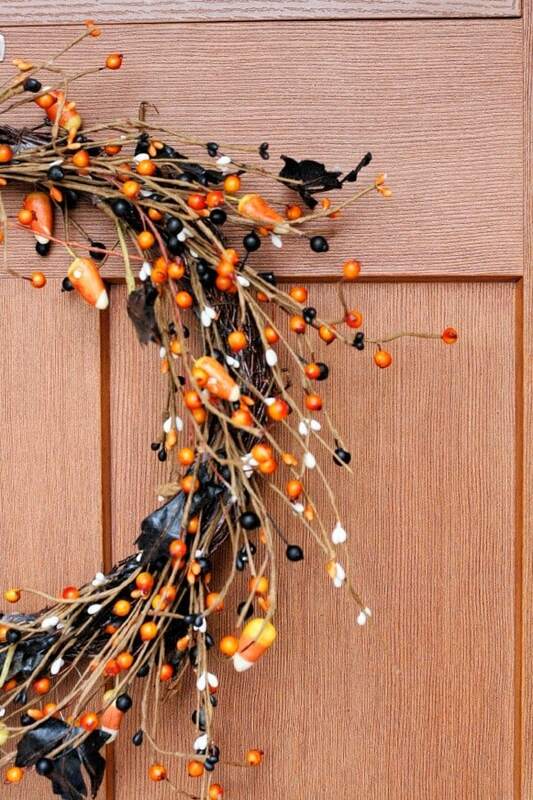 Take a grapevine wreath and weave some faux spiderwebbing through it. Spooky! I repeat – Hang some bats! 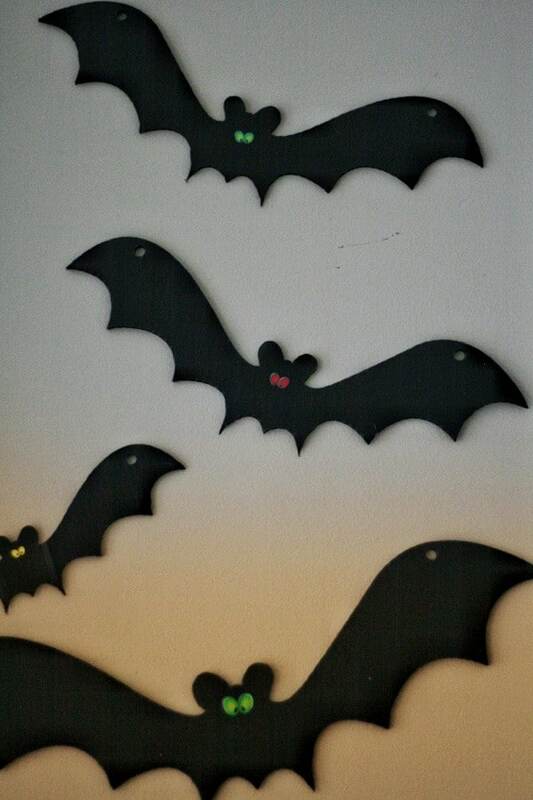 We got these inexpensive bats from Amazon. They are a tough plastic type material. We were originally going to hang them outside but with all the rain we get we decided against it. Although they do say they are waterproof. Hang a HUGE spooky bug somewhere. That’s our giant spider you can see in the background there. One of my fondest memories growing up was my dad weaving this gigantic faux spiderweb on our porch every Halloween. Complete with a giant faux spider. Halloween has always been one of my favorite holidays. Here’s a close up of this bug. 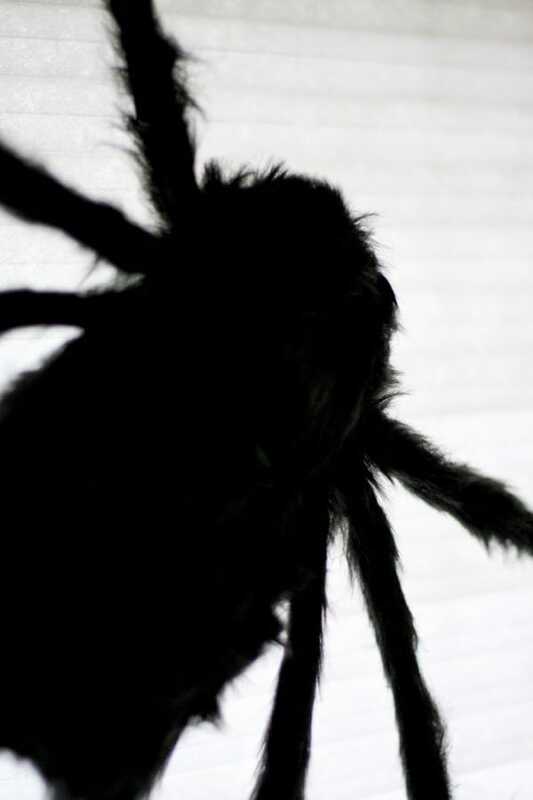 We got this giant spider from Amazon too. The legs are bendy so you can hang him pretty much anywhere. You can find those mini pumpkins everywhere. 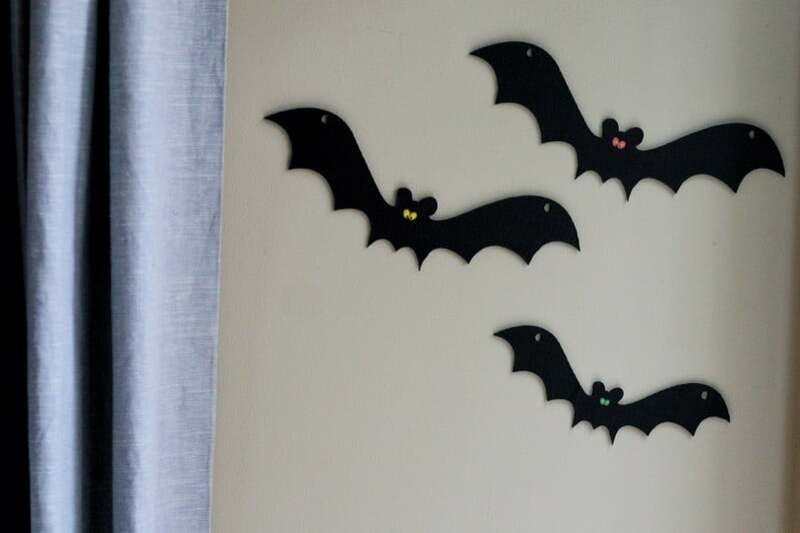 And you can make this cute Halloween Banner! 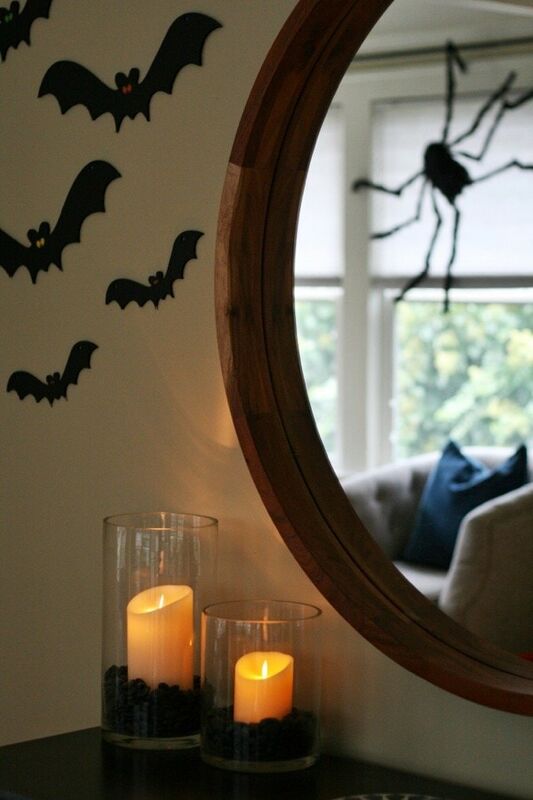 Who says you can’t decorate with candy corn too? 🙂 Unfortunately, this had to go back in the cabinet after I discovered about half missing. Hmmm – wonder who that could be? 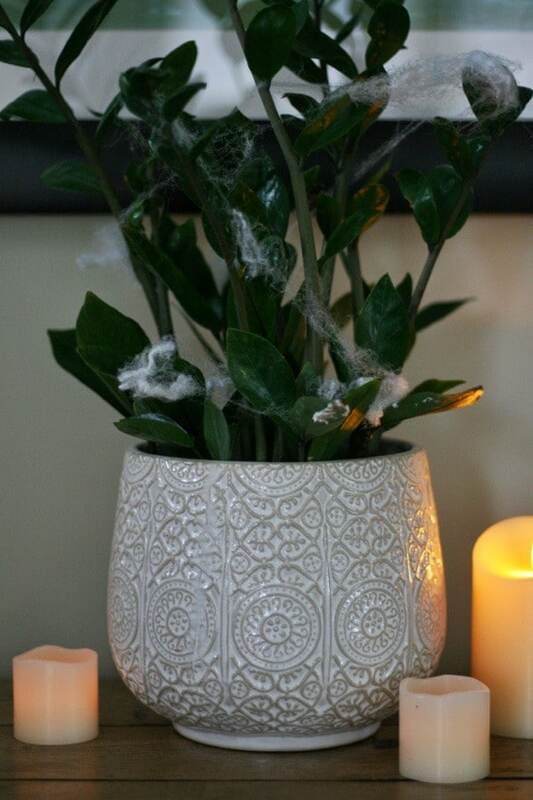 Yep – I even throw faux spiderwebbing on our plants, It makes them look extra spooky. 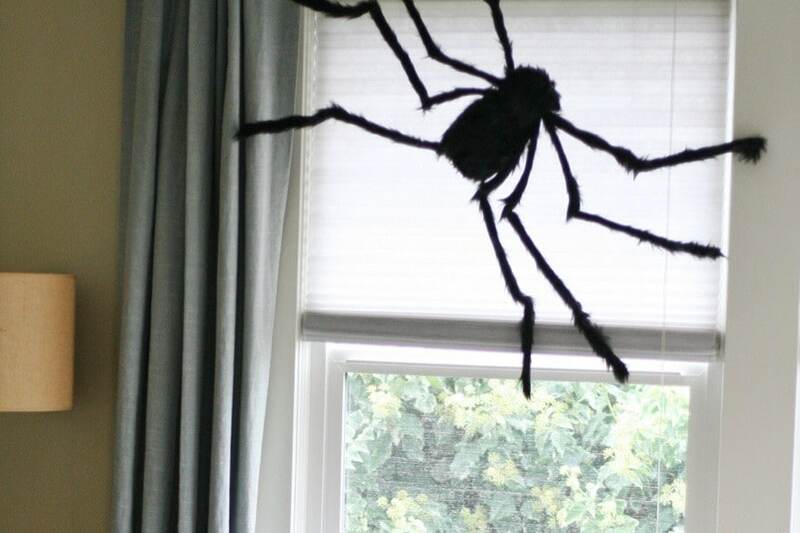 Faux spiderwebbing is pretty cheap and you can make it stick to almost anything. Don’t forget the spooky music! I don’t know about you guys but I can’t wait for Halloween!